Prior to Terror in Venice, it was extremely rare. I've been in 4 (going on 5 this weekend) Call of Cthulhu tournaments, including a pair of well-attended Regional Championships (19 and 14 players, respectively). As the T.O. of each tournament, I keep all the deck lists after the events to write up reports, etc... so far I've seen over 50 decks meant for competitive play. In all of those events, I've encountered only 1 deck that included the Day mechanic as a cornerstone element. Why? I think there are 2 main reasons. First, the Dreamlands cycle has been out of print for some time making it hard for newer players to have access to any Day/Night cards at all. Second, before TiV there weren't that many Day/Night cards to choose from. However, TiV has given Day/Night a big shot in the arm. When we finally see the Dreamlands reprints, I think it will show up even more. My top 10 nominations are Intimidate (SoA), Tear Gas (TTftS) and Patsy (Core). I like Intimidate better than Forcing the Truth because it costs only 1. Sure, it's not as fancy as Forcing the Truth or even Low Blow (Core), but it's cheap and works great with Syndicate rush. When it comes to events, I'm hard pressed to pay more than 1 unless I'm nuking an opponent's character, especially with a deck that needs to be firing off as many characters as possible in the opening rounds. As for Tear Gas, it plays nicely with Fixer (SoA) for a turn 1 cost-reduction, and is a great way to destroy annoying invulnerable characters like Carl Stanford (SoA) or Fthaggua (TKatG) that can slow you down early on. Last up, the Patsy. I can't believe this guy isn't even on the honorable mention list. Combine with B. Ramsdale Brown (TKatG), Corrupted Midwife (ER) or Hungry Dark Young (Core) to really annoy your opponent. For honorable mentions, what about Tattoo Artist (MoE) or Street Tough (TbtA)? I actually think the prevalence of day/night cards will increase in casual play, but not tournament play. Basic meta-gaming: you don't want your deck to fall apart simply based on random matchups. If more day/night will be available, the higher the possibility that you could face your deck's bane. And therefore won't risk it. A splash of day/night is still very possible though. My problem with Syndicate's fickleness toward time of day is that it is meant to be strong in both, when it really just makes them weaker and more conditional overall. Regarding Patsy, I'm willing to put it on honorable mentions, but as a card in itself (without recursion elements) it's really rather sub-par imo. It's only good as a character if there are no defending characters to oppose you, otherwise it will go insane. It's not the end of the world because you'll likely just sac it to remove tokens next turn, but I'd rather have characters on the board with more staying power to push through stories, not delay my opponent (whose tokens will go away anyway when I win the story). 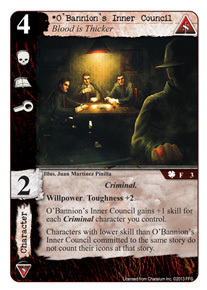 Card text specifically says that you cannot target Danny O'Bannion...so not even a second possible can be targeted, right? You could say that the text is "self-referential," but I think you're right. Patsy - He's quite useful, and I like that I can use him as a cheap body until I'm ready to pop him. But I also see the point that it's recursion that turns him from useful to a star. Tear Gas - Maybe I need to use this one more, but for a cheap attachment I usually reach for Bound and Gagged first. any other copies of that card." I think we will see Day/Night showing up as a component in competitive decks, although it might just be one component and not wholly dependent on it. Especially with the support based ones that are immune to non-Day/Night effects so their durability is good. At a minimum, San Marco Basilica will be there I think. It's true that Patsy isn't much of a character, but then I don't treat him as such. To me, he's a 1-cost event that takes away 2 success tokens from my opponent. When playing against non-investigation decks I use Patsy to avoid blocking, which lets me focus my rush deck on offense. The fact that he's a character I can easily replay (given the proper factions/cards) is just gravy. As for Tear Gas vs Bound and Gagged, my decks include both. Fixer is another personal favorite, so I like having low-cost attachments in play to reduce him. Plus, Bound and Gagged can be taken out with cards like Get it Off! (or the gagged character can be bounced back to hand if I'm pairing Syndicate with Silver Twilight), so it's not always a permanent/appropriate solution. Tear Gas piggybacks nicely with a standard Syndicate skill reduction deck so it's pretty easy to take out high-skill invulnerable characters with it (or annoying ones such as Lucas Tetlow (SoK)). Give it a try and see what you think. Patsy is more than just an Event though because you can usually use him for a body for a while before cashing him in. Until then, he's an extra point of skill, or being able to go to an additional story and your opponent either has to give up 2 tokens or divert resources to take him out. And he can't die easily either - if your opponent commits someone with Combat to kill him you can always just activate his ability before struggles resolve. Great card all around. Yeah, using both is a good solution My odds of using Tear Gas scale with how much skill reduction I have in the deck, but I like that Bound & Gagged works no matter what sort of deck I have. And yes, Fixer is awesome. I put him in most of my Syndicate decks and there's always some attachment out early whether it be Bound & Gagged or something my opponent drops like a Book of Iod or whatever. Useful 1-point (or less) attachments are the best thing that ever happened to Fixer! Since I haven't played in a tournament yet how popular is support destruction because Southside Speakeasy (IotF) seems really powerful too. I'd say support destruction is really popular. I'm also wondering: Why do you feel that Southside Speakeasy is powerful? The way I see it, it costs three and all it does is move a resource. So, it allows you to build a large domain, relatively late in the game, at the cost of reducing one of your other domains, possibly even down to zero. What high-cost cards would it allow you to play? Or did you have something else in mind? I think he means more switching a 3 domain and 2 domain around each turn, or something similar, to get 2 higher cost cards out. But no, I wouldn't recommend it. 3 cost Supports are very dangerous when they can be destroyed by a 1 cost card, so you'd be wanting to get a LOT more bang for your buck. And yes, a lot of decks run some way of removing Supports. Yep that is the reason why and yea that wouldn't be worth running then but it is a strong resource management card played a little with it in a deck without facing an opponent just seeing what cards could play each turn and the ability on turn three to pay for a 3 cost then 2 cost is great then the next turn two threes etc. Not sure this list takes into account the new deluxe for Syndicate? On the Lam - so cheap, so annoying to the opponent. Immurement - I undervalued this one at first but just for the fact it hits Festival hard it deserves a place. Instant control at any time of pretty much anything for usually 2 cost, defo worth it. Hatchet Man - David Pans cheaper swarmier mates. Henry Knoll - a finisher card for skills decks. Henry Knoll can be handy too. St. Claire (from Sleeper) also looks really great. I haven't gotten to use her that much yet but she has great icons for her cost as well as a strong ability.